These old fashioned popcorn balls recipes got plenty of use in our family. Dad would boil up some molasses or corn syrup, I would pop the corn, and we would make some treats after the evening's farm chores were done. We sat nibbling on them in front of the old GE radio while listening to the "Amos 'n' Andy" program, and we'd laugh so hard at their crazy antics. "Our Miss Brooks," "The Great Gildersleave," "Baby Snooks," and other old time radio shows have all been eclipsed by television, but the old fashioned popcorn balls are as delicious as ever. Try them and see! This is the same recipe that Dad and I used, and it never fails to make delicious popcorn treats. 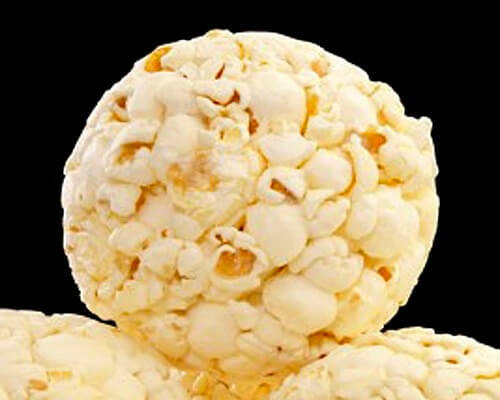 One method of making popcorn balls requires a pint of molasses or syrup (either corn syrup, sugar molasses, or maple syrup), two cups of sugar, two tablespoonfuls of butter, and a teaspoonful of vinegar. Cook till the syrup will harden into a firm ball when a little is dropped in a cup of cold water. Pour the hot syrup over four or five quarts of popcorn, stirring till each kernel is well coated, when it may be pressed with the hands into balls or molded into any form desired. It's a good idea to remove all unpopped kernels first. Enjoy. Take three large ears of popcorn (about one cupful). After popping the corn, shake it down in pan so the unpopped corn will settle at the bottom; put the nice white popped corn in a greased pan. For the candy, take one cup of molasses, one cup of white or light-brown sugar, one tablespoonful of vinegar. Boil until it will harden in water. Pour on the corn. Stir with a spoon until thoroughly mixed, then mold into balls with the hand. No flavor should be added to this mixture, as the excellence of this commodity depends entirely upon the united flavor of the corn, salt, and the sugar, or molasses. 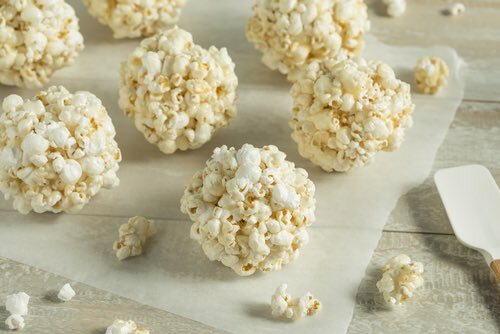 This old time popcorn candy recipe is similar those for making popcorn balls, except the candy mixture isn't allowed to boil to the hard ball stage. Hence, the candied popcorn remains loose and is not formed into balls. Put into an iron kettle (or pot) one tablespoonful of butter, three tablespoonfuls of water, and one cupful of white sugar; boil until ready to candy, then throw in three quarts nicely popped corn (remove all unpopped kernels); stir vigorously until the sugar is evenly distributed over the corn; take the kettle from the fire and stir until it cools a little, and in this way you may have each kernel separate and all coated with the sugar. Of course, it must have your undivided attention from the first, to prevent scorching. Almonds, English walnuts, or, in fact, any nuts are delicious when prepared in this way. One cup of molasses, one cup of brown sugar, one tablespoon of vinegar, butter size of an egg. Boil all ingredients until brittle. Pour this over two quarts of popcorn and mold into balls. For special occasions, you can add a few drops of red, green, or blue food coloring to the candy mixture. Kids love colored popcorn balls! Wrap them in waxed paper to keep them fresh until serving. For holiday popcorn balls: Color red or green for Christmas, pink for Valentines, or pastel colors for Easter. Peanuts or chopped cashews when added to the syrup make a tasty change. Never be afraid to experiment when making candy. Even the failures often taste delicious.